How to get there: Drive to the small village of Alvdal, about 4.5 hours north of Oslo. From Alvdal, drive north on Hwy. 3 passing a Statoil gas station on your left, shortly thereafter make a left on the road to Folldal. After 2.2 km make another left towards Sølendalen. After 4.9 km stop and pay toll (NOK 40 in 2003) on your left hand side of road (there is a big sign there). Continue 7.5 km further, fork right and drive another 14.5 km. About half way, there is another toll crossing (self serve, NOK 10 in 2003). This is close to the place Follandsvangen. Shortly before the completion of this road you will see Flatsætra (small side road to your right). We parked in a spot where the T-marked trail was close to the road on its left hand side, GPS coordinates N 62:00.800, E 010:11.831, elevation 965 meter. Route description: Proceed along the T-marked trail down to a lake and then more east to a bridge across the river. Continue along the trail passing several smaller lakes until one reaches the north end of Klettsjøen (987m). Here the trail forks (there is a sign). Turn left (east) and cross the narrow band between the two lakes. As the trail starts climbing, leave it and aim for a point on the ridge that provides easy hiking avoiding the steeper (and more rocky) area further right. 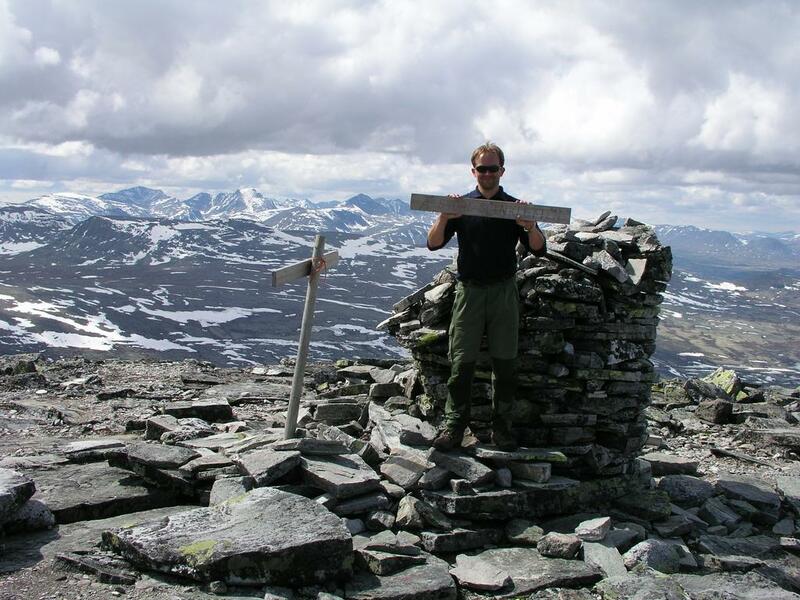 As one reaches the north ridge, follow it to the summit of point 1690, North-west of Storsølnkletten. This point has GPS coordinates N 61:59.086, E 010:16.219. From the NW summit, one descends to the saddle that separates the main summit. This saddle has elevation 1579 meter and GPS location N 61:58.842 E 010:16.672. From here, the climb to the summit is straightforward, (YDS) class 2. Comments: I did this hike with my friend Arnt Flatmo. We started at 1105, made the NW subsidiary summit (1690 m) at 1320, and the main summit at 1405. We continued after a 25 minute break in good sunshine at 1430 and made the smaller Veslsølnkletten (1454m) at 1625. After a short break there we hiked back, reaching the car at 1825. Veslsølnkletten, Storsølnkletten and the NW 1690 summit as seen from the road to Flatsætra. 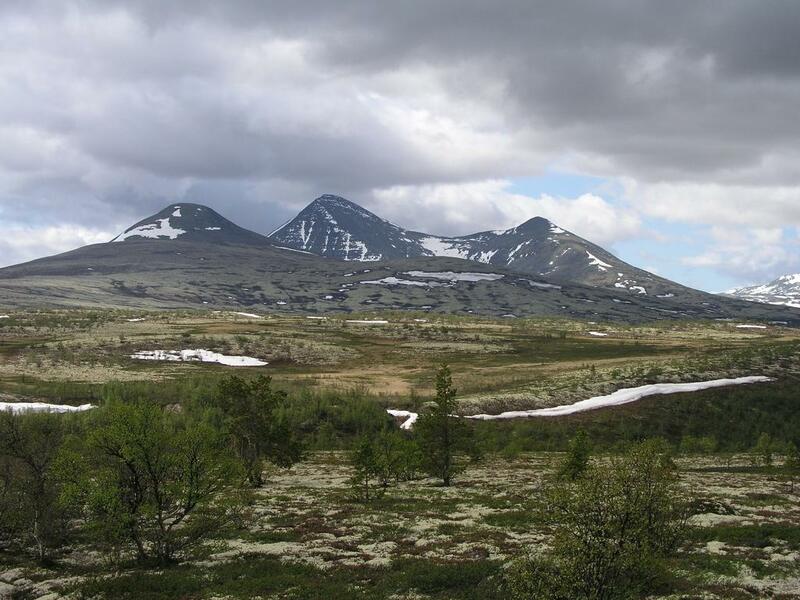 Arnt on Storsølnkletten, Rondane behind. Rondane viewed from Store Sølnkletten. 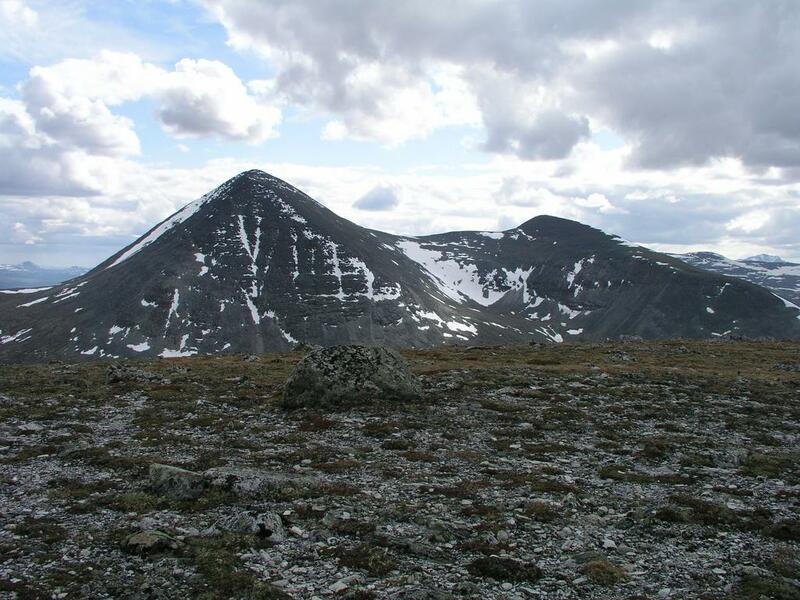 Storsølnkletten and the NW 1690 summit as seen from the top of Veslsølnkletten.